The spiritual FRUIT of praying the Third Joyful Mystery is the LOVE OF POVERTY. appears at the end of this page. In those days a decree went out from Caesar Augustus that the whole world should be enrolled. This was the first enrolment, when Quirinius was governor of Syria. So all went to be enrolled, each to his own town. And Joseph too went up from Galilee from the town of Nazareth, to Judea, to the city of David that is called Bethlehem, because he was of the house and family of David, to be enrolled with Mary, his betrothed, who was with child. 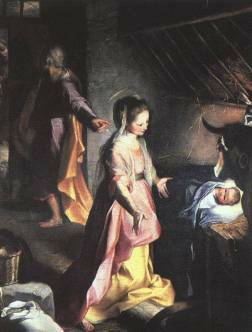 While they were there, the time came for her to have her child, and she gave birth to her firstborn son. She wrapped Him in swaddling clothes and laid Him in a manger, because there was no room for them in the inn. Now there were shepherds in that region living in the fields and keeping the night watch over their flock. The angel of the Lord appeared to them and the glory of the Lord shone around them, and they were struck with great fear. The angel said to them, "Do not be afraid; for behold, I proclaim to you good news of great joy that will be for all the people. For today in the city of David a Saviour has been born for you who is Messiah and Lord. And this will be a sign for you: you will find an Infant wrapped in swaddling clothes and lying in a manger." And suddenly there was a multitude of the heavenly host with the angel, praising God and saying: "Glory to God in the highest and on earth peace to those on whom His favour rests." When the angels went away from them to heaven, the shepherds said to one another, "Let us go, then, to Bethlehem to see this thing that has taken place, which the Lord has made known to us." So they went in haste and found Mary and Joseph, and the Infant lying in the manger. When they saw this, they made known the message that had been told them about this Child. All who heard it were amazed by what had been told them by the shepherds. And Mary kept all these things, reflecting on them in her heart. Then the shepherds returned, glorifying and praising God for all they had heard and seen, just as it had been told to them. on earth, as it is in Heaven. but deliver us from evil, Amen. the Lord is with thee! pray for us sinners now, and at the hour of our death, Amen. Repeat the 'Hail Mary' 9 more times, for each remaining bead in the group of 10 (the 'decade'). Glory be to the Father, and to the Son, and to the Holy Spirit! O my Jesus, forgive us (our sins), save us from the fires of Hell! Lead all souls to Heaven, especially those in most need of Thy mercy, Amen. 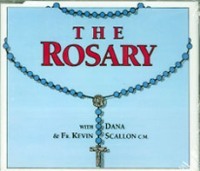 See rosaries with added 'Glory Be' & 'Fatima' beads! recitation of the decade of prayers. twice, then advance about half-way.